How Will a Larger Throttle Body Affect My Engine? The throttle body is an important part of the vehicle that allows air to flow into the engine. As with all combustion, air is required for an engine to fire properly. Generally, the more air flow available, the higher the power output of an engine will be. 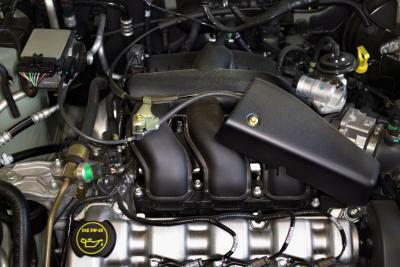 The throttle body contains two flaps which can open or close. When the gas pedal is pressed, these flaps open to allow air into the engine. If a throttle body with larger spacing and bigger flaps is installed, more air is able to flow into the engine, and power can be increased. Because larger-spaced throttle bodies allow more air into the engine, several aspects of performance are improved. The most noticeable performance in change is felt when the gas pedal is pushed, or "floored," quickly, such as during passing acceleration. A larger throttle body delivers air at a higher rate than a stock engine, allowing the driver to feel an accelerating response from the vehicle sooner. In addition to increasing acceleration performance, larger throttle bodies can also boost overall horsepower. This gives the engine increased power and torque, which may be helpful in situations such as towing. Commonly, adding an aftermarket throttle body can increase engine power by 15 hp to 25 hp. While a throttle body with larger spacing can have a positive impact on engine power, several considerations also affect performance. In vehicles, the engine can only run as long as there is a way for the exhaust to escape. When air flow increases, more exhaust gases are created. If the car's exhaust system is not large enough, engine performance will not improve. Because of this limitation, most vehicles with larger throttle bodies also require the addition of aftermarket exhaust systems. By combining a larger exhaust with increased airflow, the engine can create more power with fewer limitations.